After riding his bike for more than 700 miles over 12 days, Carlos Gutierrez, — a Chihuahua native and businessman whose legs were cut off by Mexican gang members — completed his "Pedaling for Justice" trek Saturday in Austin. After pedaling more than 700 miles over 12 days through dozens of Texas cities and towns that witnessed his infectious laughter, Mexico’s latest symbol of hope in a war-ravaged country finally broke down. 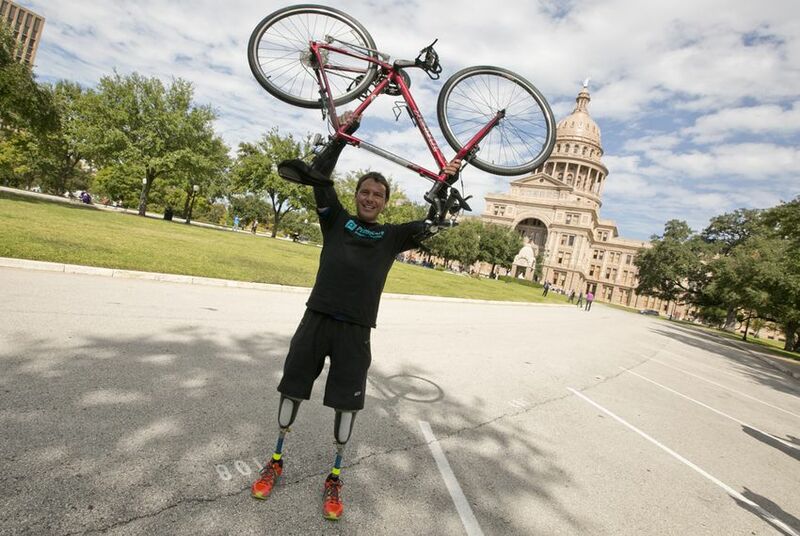 Carlos Gutierrez — a businessman and Chihuahua native whose legs were cut off by Mexican gang members for failing to pay a $10,000 monthly extortion demand — arrived in Austin on Saturday after leaving El Paso on Oct. 29 with three other cyclists on his “Pedaling for Justice” tour. Hours earlier, outside of San Marcos, Gutierrez said the purpose of his bike tour is to raise awareness about the impunity for violent criminals in Mexico and to support his fellow asylum seekers. What it isn’t, he said, is a protest of the United States government. But what Gutierrez does push back against are claims that asylum seekers fleeing violence in Mexico are abusing the system. Lawmakers have raised concerns that some petitioners looking for any way to enter this country are trying to game the system. “It’s not a game, it’s due to the circumstances [in Mexico] that we are here,” he said. In Austin, Gutierrez was flanked by members of Mexicanos en Exilio, a group founded in 2008 by his attorney, Carlos Spector. It comprises more than 100 families affected by the violence in Mexico. Spector says U.S. asylum laws make it difficult for Mexicans fleeing violence. Petitioners must prove to immigration officials — either an immigration judge or an asylum officer – that they have a warranted fear of persecution or death due to several factors, including religion, ethnicity, participation in a political group or sexual orientation. More than 90 percent of those requests are denied, however. Gutierrez was allowed to temporarily live and work in the U.S. But the status he seeks, a legal resident granted political asylum, has yet to come and until a final decision is rendered, he is limbo. Spector said he would file a motion next week to request that Gutierrez and his family get a hearing before an asylum officer with U.S. Citizen and Immigration Services, rather a likely more adversarial meeting with an immigration judge. While he waits, Gutierrez said, he wanted to do something inspiring. He acknowledges that the media attention and support he’s received can only help his case. But those riding with him say the ripple effects of the ride have sparked hope across the state for others facing a variety of challenges. Ben Foster, an organizer with Velo Paso, the city’s bicycle-pedestrian coalition, was one of three riders who began the journey with Gutierrez and saw it through to the end. Throughout the trek, Foster said cancer patients, people with speech impediments and others have credited the cyclists for inspiring them. There was also an astonishing number of people who could sympathize with Gutierrez, he added. The support began when Gutierrez met the man he calls his “angel” — Eddie Zepeda, his prosthetic surgeon. Such support hasn’t stopped since. Earlier in the day Saturday, with fewer than 30 miles left on Gutierrez’s journey, a stranger named Laura Nelson stopped him outside of a convenience store. “Is that you?” she asked in Spanish, visibly shocked to see the man she’s only known through news reports walk out of the Sac N Pac in Kyle, Texas. The two embraced, posed for pictures and chatted briefly before Gutierrez and the other cyclists, which grew to nine, continued toward their final destination. As he pedaled away, Nelson, from the Mexican state of Guerrero, fought back tears and wished him well. “I just hope he’s OK after everything he’s been through,” she said. Editor's Note: An earlier version of this story referred to Velo Paso as Velo El Paso.